Why do not you extend it to have more pages? with different categories? yggdrasil, thank you for the update. and keep it up What are the changes in the new script? After, testing the ISO, on virtual machine. I burned the DVD and tested it on vmware and it works perfectly. Thenchecked the DVD on real and virtual machines. I got three different results. 1 I checked on my laptop (Hp pavilion DV4). It doesn't work. I just see a blank screen after seeing the first 3 line text of Aero studio. My CD drive works and I also tested the DVD for vmware. I then tested the ISO by adding it on the boot manager using EasyBCD and boot from it. It works perfectly well. 2. Then I checked on my friends' Lenovo and Comapaq laptops and it works perfectly. I also checked on few hp desktops, it works well. 3. Then lastly, I checked on Dell Studio and Inspiron laptops. The boot menu comes but when I click on each buttons, I only see grub4dos text message. I would be glad to know the reason for the different results. also in windows 7 v6.1 build 7260. I tested the process above in windows XP and Win 7 ,test was OK. I will definitely download your new script. Thanks for the update. I didn't use your script for burning the ISO. I used Aero studio itself using the workaround Shirin gave in the first page. 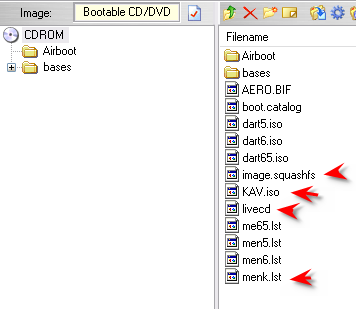 Aero studio only works when there is 1 folder in the source directory. Sorry for the double post. I didn't see your post. Thank you for the important detail. I just want to know one thing. could you send me, the structure of the Kaspersky resuce Disk location in the Aero studio ISO and the grub4dos command you used? 1.You can see The root of My tested ISO in figure below . I use this method to Slax as well -but then I reduce ISO from files that are extracted to the “root”. I have discover AeroStudio one week ago and since I try to build my own USB key. I have read all your wonderful tutorials and all the posts about Aero but I can't succeed. I just made a search in Winbuilder forum for "run in ram" and nothing come. Could you please point me where I have to check this box ? I think I have find the correct information.